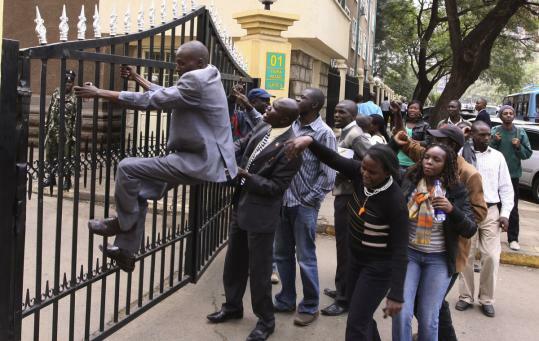 NAIROBI — Revelations that $45 million meant to pay for elementary students’ education was stolen is turning into political poison in Kenya, where activists yesterday locked themselves in the education minister’s offices to demand his arrest. The United Kingdom, a major donor to Kenya, told the government that the portion of stolen funds that Britain donated must be repaid. Britain said it would not give the Kenyan government any more money until there is “convincing evidence’’ of substantial improvements in the government’s integrity and financial management. Kenyan leaders so far have passed the blame despite calls for officials at the Ministry of Education to resign. The department’s minister, Sam Ongeri, told Parliament last week that he is not to blame because he was not in office when the thefts began in 2005. Ongeri said he helped in detecting the fraud. “My conscience is free and clear because I have done my duty to the best of my ability,’’ he told Parliament. President Mwai Kibaki received praise from around the world when he implemented the Free Primary School Education Program in 2003, a top election pledge. The program enrolled more than 1 million children who had never sat in a classroom. But Kibaki’s failure to keep another election promise — to fight corruption — has seen those gains tarnished. The United States, which provided funding for Kibaki’s education program, suspended funding last year, following the lead of Britain, which stopped donating in 2009. Before the suspension Britain gave nearly $90 million over five years. In 2009 a government audit found that education officials had stolen more than $1 million. But last week a more thorough audit found that roughly $45 million was taken.